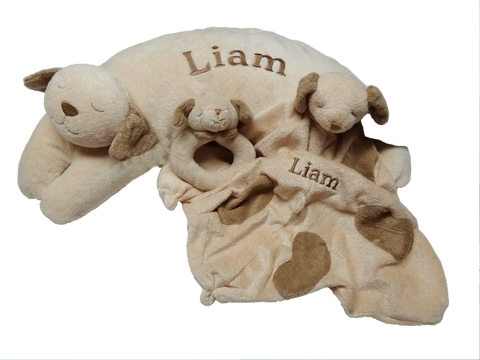 The ANGEL DEAR™ 3 Piece Gift Set consists of a Curved Pillow, a Small BlankIe and a Soft Rattle in animal characters. The Curved Pillows are versatile light weight pillows with the sweetest faces! They give great support for sleepy heads and nursing moms. They are made of very soft velour fabric. The face details are all embroidered. The pillow measures 20" long by 8" wide by 4" thick. The cover comes off for washing. The Blankies are sweet, charming, cashmere soft blankets with just the right simple details to soothe and delight your baby. The face features are all embroidered. The corners are "knotted" making it easier for your baby to grasp and to chew on. The blankies measure 14" square. They are completely machine washable and dryable. (You will not see the embroidery on the backside of the blankets, because we open them up before we embroider the names and then sew them up again). The Ring Rattles are made of the softest velour fleece fabrics. They are great for tiny fingers to hold on to. The rattles measure 4 Inches. The Price Includes one embroidered name on the pillow and blankie (ie: Michael, Alexis, etc) .